The Maison du Vigneron is a prized haven of traditional skills and unbeatable winemaking knowledge, laying out a full selection of wines and crémants from the Jura region. White wines and red wines, vin jaune and vin de paille, Crémants du Jura and Macvin liqueurs, all lie maturing under our watchful gaze within barrels in our wine storerooms. The Maison du Vigneron is the 1st producer of the Jurassian winegrowing region, passionately raising the entire region’s great reputation. With its impressive prevalence throughout all the Jurassian appellations, the Maison du Vigneron constantly strives to establish great renown for the Jurassian vines and their wonderful variety. The wines still owe their great reputation to the renowned quality of the region’s soil, as well as its conservation of cultural practices and traditional winemaking methods. In order to satisfy our own high standards of quality, we work in accordance with a quality standards charter that was drawn-up in collaboration with member winemakers who today control a total winegrowing area of 220 hectares. Nicolas Haeffelin’s Family has deep roots in the Alsatian Region, they established in the South of Alsace in the early beginning of the XVI Century. The Family has had a Winemaker in each generation since 1560 which is something quite unique in Alsace. Nicolas grew-up seeing around him all the members of his family involved in the Wine Business. His dad’s father used to take him to the vineyards as often as he could and when his Father started on his side the renewal of Domaine Viticole de la Ville de Colmar Nicolas would spent all his free time at the Winery and especially riding his bicycle and cycling through the 10,5 hectares of the Clos Saint Jacques next to the Winery. More then all harvest time was his favourite period of the year, seeing grapes being processed, tasting the juice coming straight of the press and all the flavours of the Aromatic Wines fermenting in the cellar was such a pleasure every year and was probably the beginning of his passion for Wine. Later on at the age of 14 he would spend most of his free time and school holidays giving a hand at the Winery and the Vineyards. Two things he loved more then all was trellising the Vineyards during summer and helping his father cleaning the old wood casks that were in the cellar by that time. As a great chance his father took him with him as often as he could to visit the importers/distributors of the Domaine in countries nearby but also overseas which enforced his passion for the Wine Business. Being so close to the demand of the customers was really important to understand by that time. So naturally he chose to make Winemaking studies and has done all this years in Burgundy to become Oenologist at one of France’s most prestigious Oenology school the Institut Jules Guyot in Dijon. During all this time he made internships in Burgundy in Small Domaines but also by a negociant and same in Loire. In 2006 before entering his final year for the DNO (National Diploma of Oenology) he chose to go for a Vintage in New Zealand where he spent 6 Month working in a familial Winery to see how Sauvignon was made but also to help out for the first Vintage for some grapes that he knew a bit more, Riesling and Gewurztraminer being processed for the first time in this Winery. 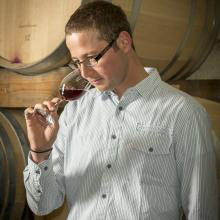 Finally, when graduated in 2008 he joined his Father at Domaine Viticole de la Ville de Colmar. Climate: warm, relatively dry summers and cold winters. The variation between valley and hillside locations is quite pronounced here as a result of the increased altitude. While the eastern, more mountainous areas of Jura reach heights above 4500ft (1370m), the main wine-growing belt is restricted to the slightly lower-lying land in the west, averaging 1000ft (305m). The majority of Jura's vines are planted on south-facing slopes, to make the most of the sun's rays in this cool climate.